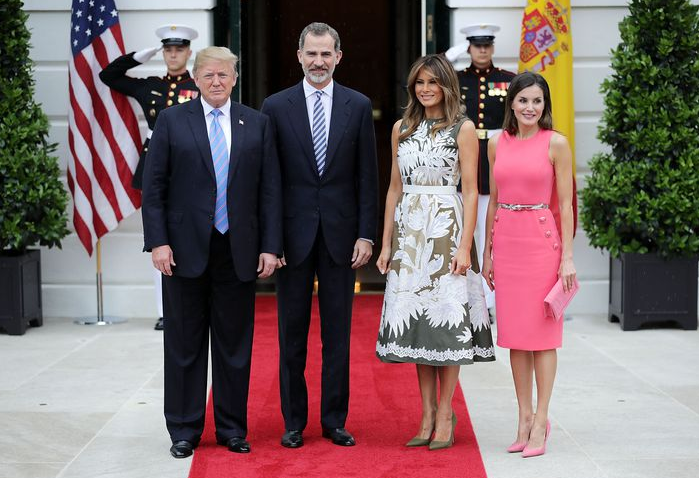 President Donald Trump and First Lady Melania were keen to welcome the Spanish Royal couple of King Felipe and Queen Letizia at the White House yesterday. The ladies are both well-known fashionistas so it was clear that the style stakes would be high during this visit. As expected, all eyes were on Donald and King Felipe’s glamorous wives, who had both gone out of their way to show off their age-defying figures, wearing colorful dresses and their signature stiletto heels. Spanish King Felipe and Queen Letizia have been in the United States since Thursday. They have already visited the cities of New Orleans in Louisiana and San Antonio in Texas in recent days. There they discussed the three hundredth anniversary of both cities, which have historical ties with Spain. to women, it matters not what the man looks like as long as he's rich…… trump is looking unhealthy. he needs to change his diet dramatically and lose weight. The last post comment sounds like a guy who has women issues and claims to be some sort of health official. More than likely a libtard. No idea how they’re able to wear stilettos. Best I’ve ever been able to handle is 3.75” high, & NOT thin stiletto heel! Melanie puts Big Mike to shame. In every way. EASILY out dresses, out classes every woman on the Left.